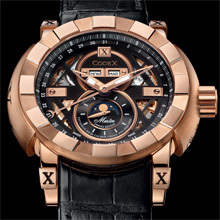 The CODEX IDENTITY Venus brings the Venus 203 mechanical movement into the spotlight once again with two limited and numbered editions. This vintage movement, a 100% Swiss watchmaking masterpiece dating from the 1950s and 60s, indicates the day, date and month as well as the phases of the moon. 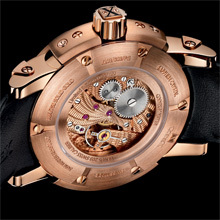 Incarnation of highly technical expertise with sublime aesthetic results, this timepiece is decorated with hand guillochage and a skeleton dial revealing the circular graining on the movement. 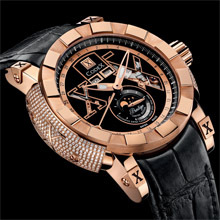 The Master version, limited to 100 pieces, is housed by a case in massive 18-carat rose-gold and features a hand-sewn black alligator leather strap, while the Prestige version, limited to 75 pieces, is also decorated with 431 brilliant-cut diamonds (1 ct).